Well the depression stage has slowly been creeping up on me. Unfortunately for the nearly 3 weeks I was out of work I was mostly in Denial. I had a little bit of anger mixed in there but mostly denial. The anger stage hit full force recently and has just as quickly turned into depression. It's a very scary place for me to be. I had major depression once and tried to kill myself by ODing on pills. This was before I was married (in college) so it was a long time ago. I have since gotten better and not been on any anti-depressants for a long long time. I returned to work full time this week but the only day I've been able to work a full day is Monday. Today I only lasted 2.5 hours. I called my therapist but she is on vacation till next week and I'm her first appointment (on Tuesday so in 5 days). I talked to her briefly and she suggested anti-depressants. I don't want to be on them permanently and made that clear but she thinks it will help me cope. So I go see my PCP tomorrow to discuss it. I hope she's willing to help me with out having to see my medical records because my therapist is out of the office and I could really use this long weekend (day off on Monday) for the medications to kick in. Although I know it can take a few weeks for them to work. I'm NOT to keen on medication but I do feel I need the boost. 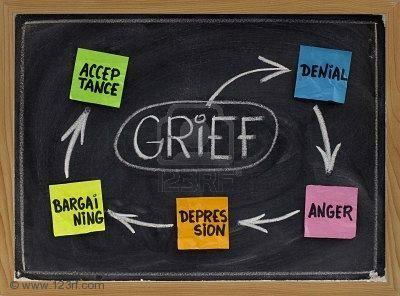 My sister in law is living with me right now and going through a crisis of her own so she is grieving too. It's nice to have her around because we can talk to each other about our feelings.